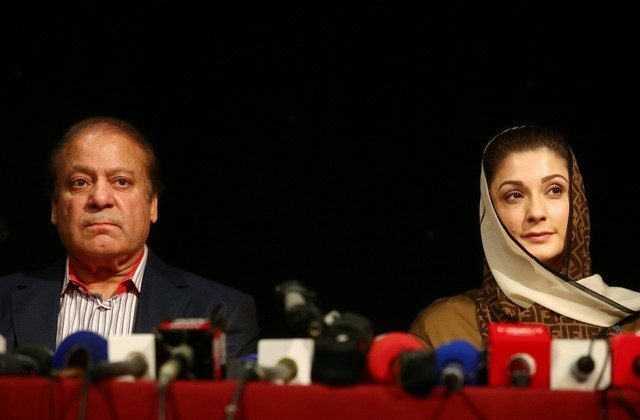 ISLAMABAD/LAHORE—Ousted Pakistani Prime Minister Nawaz Sharif and his daughter Maryam, both sentenced to lengthy jail terms in absentia, are due to return to Pakistan on Friday, July 13, in a high-stakes gamble to galvanize their beleaguered party ahead of a July 25 general election. On Friday afternoon, thousands of police had been deployed in the central city of Lahore and shipping containers placed along main roads, which could be used to block protesters from moving towards the airport, where Sharif is expected to land around 6:15 p.m. local time. Local police official Naveed Shah told Reuters his current orders did not include restricting people’s movements, but that could change when supporters of Sharif’s Pakistan Muslim League-Nawaz (PML-N) party take to the streets. Their return could shake up an election race marred by claims Pakistan’s powerful military is working behind the scenes to skew the contest in favor of ex-cricket hero Imran Khan. Sharif alleges the military is aiding a “judicial witchhunt” against him and his PML-N party. The party’s past five years in power has been punctuated by the civil-military discord that has plagued Pakistan since its inception. The opposition Pakistan People Party (PPP) also alleged “pre-poll rigging” this week, but did not specifically name the armed forces. To prevent PML-N workers staging a hero’s welcome on the streets, authorities said they will arrest the father and daughter upon landing and transport them to the capital Islamabad by helicopter, local media reported. Sharif’s return comes at a time of dwindling fortunes for his party, which one year ago was considered a run-away favorite to retain power. Khan has painted Sharif as a “criminal” who has looted the state for decades, and welcomes his prison term as overdue accountability. Sharif was ordered jailed after failing to explain how the family acquired the London flats in a case stemming from 2016 Panama Papers revelations that showed they owned the apartments through off-shore companies. Maryam was convicted for concealing ownership of the apartments. They both deny wrongdoing. After the Supreme Court ousted Sharif last July, the courts barred him from heading the PML-N party he founded. His brother Shehbaz became PML-N’s president, but Sharif remains the power behind the throne. PML-N has also been riven by internal divisions. Sections of the party oppose Sharif’s combative approach against the army and fear it will turn off voters in a deeply conservative and patriotic Muslim nation of 208 million people. PML-N leaders say authorities have begun a crackdown against union council leaders, the street-level party workers who bring out people on the streets, detaining hundreds of workers over the last 36 hours. “Those who think they can scare us…open your ears and hear this: we are winning this election,” Shehbaz Sharif told reporters in Lahore on Thursday. On Friday morning, a bomb blast struck the convoy of Akram Khan Durrani, an ally of Sharif’s PML-N from the religious Muttahida Majlis-e-Amal party (MMA) in the northern town of Bannu, killing four people. The MMA is expected to challenge Khan’s PTI in the northern Khyber Pakhtunkhwa province in the upcoming polls.